The Maricopa Community Colleges District ITS team has successfully implemented upgrades to My.maricopa.edu, which will help ensure efficient maintenance of content and streamline navigation for students. As you will see, articles on the site are now categorized into easy to understand topics and links to college websites are available in relevant articles for a clear connection. There's also a simplified checklist for new students. We hope you will test-drive the new features and provide your feedback and insights by using the Report a Problem link located in the footer of the site pages. The District ITS team will be working on a regular review cycle to update and maintain content to ensure that it is accurate and useful to students. 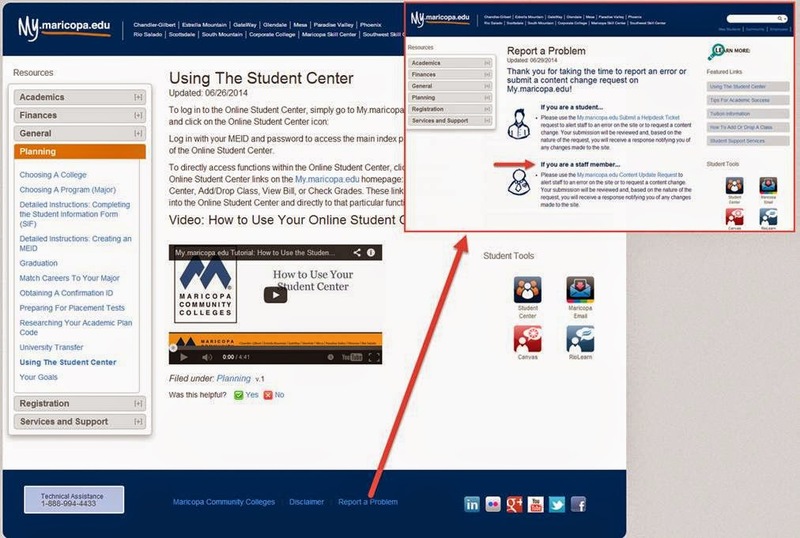 If you have any problems using My.maricopa.edu, you can reach technical support by calling 1-888-994-4433 or using the Online Student Center and Canvas Online Support Chat, both of which are available 24/7. Here's a YouTube tutorial with basic information on how best to resolve most technical issues: http://ow.ly/yW0LA.